The Institute for the Study of War (ISW) is proud to co-sponsor the 2018 Asymmetric Threat Symposium being held on October 17, 2018 at Valo Park in McLean, Virginia. ISW's latest map assessing Iranian and Russian positions in Southwest Syria near the Israeli and Jordanian borders (April 2018). This updated map depicts control of terrain in Syria and the posture of the Bashar al Assad regime-Iran-Russia coalition as of April 2018. Russia will likely intensify its campaign to disrupt Latvia’s political stability ahead of Latvia’s fall 2018 parliamentary elections. The U.S. should support NATO ally Latvia as it confronts Russia’s hybrid warfare and use the April 2018 Baltic Summit to reinforce its commitment to defend Latvia, Estonia, and Lithuania. 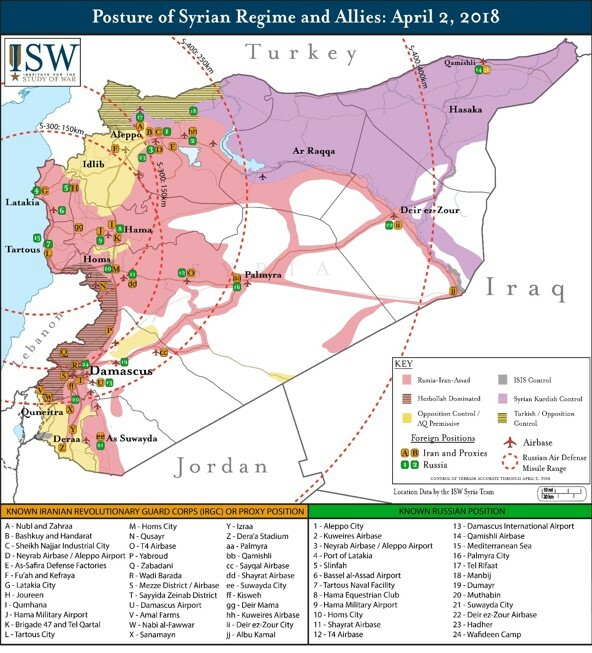 This ISW Control of Terrain Map provides an assessment of the approximate territory held in Syria by various actors on the ground. The map is updated through March 22, 2018. Turkish President Recep Tayyip Erdogan has threatened to conduct military operations across six locations in eastern Syria and Iraq following the Syrian Kurdish withdrawal from Afrin City in northwest Syria. Russia and Iran seek to use Turkey to undermine the U.S. and may encourage Turkey to prioritize operations in areas that would undermine American interests. Watch ISW President Kimberly Kagan speak at a March 19, 2018 town hall discussion on Syria and failing and fragile states for Public Radio International.